"This book is excellent for academic libraries that serve horticultural programs and organic chemistry programs." "Undoubtly, the book serves as a comprehensive source of information focusing on industrial profiles of medicinal plants…Taken as a whole, Geranium and Pelargonium is an excellent resource for the pharmacognosists, phytochemists and phytopharmacologists, as well as other professionals interested in botanical medicine and plant chemistry of these genera." General Introduction Section Geranium. History of Nomenclature, Usage and Cultivation of Geranium and Pelargonium Species. 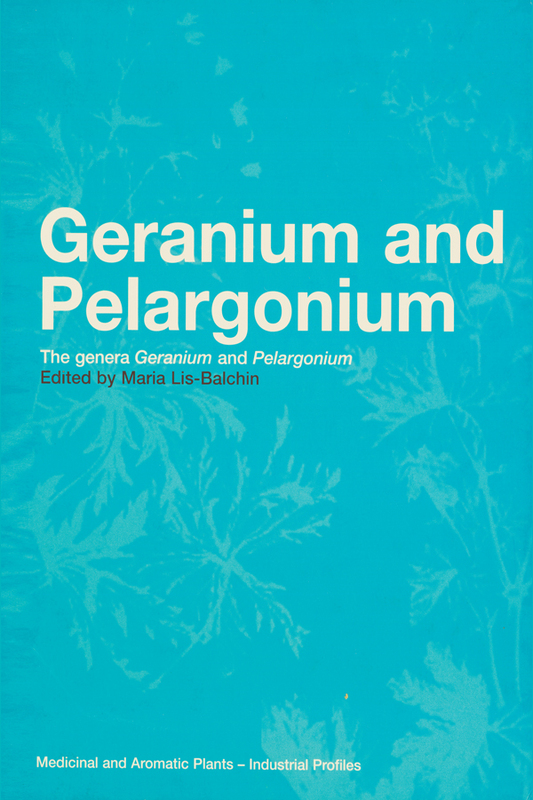 The Taxonomy of Geranium Species and Cultivars, their Origins and Growth in the Wild. Phytochemistry of the genus Geranium. Cultivation and Harvesting of Geranium Macrorrhizum and Geranium Sanguineum for Medicinal Use in Bulgaria. Production, Extraction, Distillation and Use. Use of Geranium Species Extracts as Herbal Medicines Section Pelargonium. The Taxonomy of Pelargonium Species and Cultivars, their Origins and Growth in the Wild. Cultivation and Sales of Pelargonium Plants for Ornamental Use in the UK and Worldwide. Growing Pelargoniums in the Garden, Conservatory and for Shows. Phytochemistry of the Genus Pelargonium. Pharmacology of Pelargonium Essential Oils and Extracts in vitro and in vivo. Antimicrobial Properties of Pelargoniums. Essential Oils from Different Pelargonium Species and Cultivars and their Chemical Composition. Chemotaxonomy of Pelargonium based on Alkaloids and Essential Oils. Phylogenetical Relationships within the Genus Pelargonium based on the RAPD-PCR Method of DNA Analysis Correlated with the Essential Oil Composition. Geranium Essential Oil: Standardization, ISO; Adulteration and its Detection Using GC, Enantiomeric Columns and Bioactivity. 'Rose Scented Geranium' A Pelargonium Grown for the Perfume Industry. Cultivation and Distillation of Geranium Oil from Pelargonium Species in India. Micropropagation and Biotechnological Approaches to Tissue Culture of Pelargonium Species and Essential Oils of Scenteds. Geranium Oil and its Use in Aromatherapy. Perfumery and Cosmetic Products Utilizing Geranium Oil. New Research: Possible Uses of Various Pelargonium Leaf Oils and Extracts as Food Preservatives. Pelargonium Reniforme and Pelargonium Sidoides: their Botany, Chemistry, and Medicinal use. Insecticidal effect of Pelargonium Extracts. Correlation of the Chemical Profiles of the Essential Oil of Pelargonium (Geranium oil) and Others Seperatel and in Mixes, with their Relaxant or Stimulant Properties in Man and Smooth Muscle Preparations in vitro.